New Podcast Episodes: Japanese Beetle, Pollinators, Diseases, and More! If you have not yet checked out our new podcast on fruit and vegetable pest management, called "What's Killing My Kale," this is a great time to give it a listen. It's easy - just click on the episode titles, and hear the recording out of your phone or computer. grapevine leaf near Red Wing, MN. Despite the name, it's not just about kale. 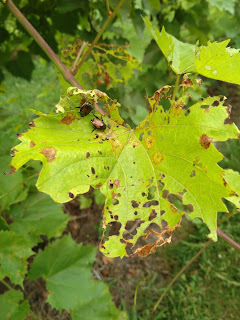 We release timely episodes on all kinds of pest topics, based on the insects, diseases, or weeds that are currently causing problems for Minnesota fruit and vegetable crops. The podcast is hosted by Annie Klodd and Natalie Hoidal. Each episode is an interview with an expert - either a researcher, farmer, or Extension educator - about the latest and most effective ways to manage that pest.